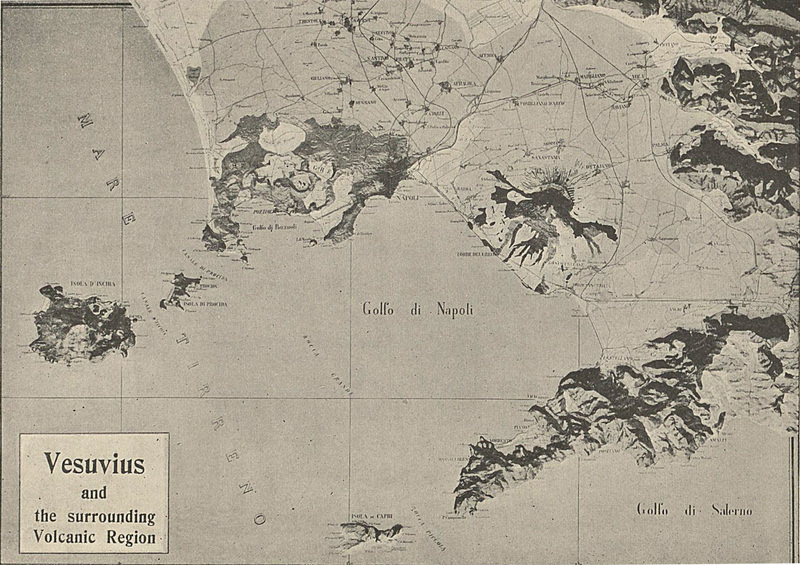 Maps of the Royaume de Naples et de Sicile, Regno di Napoli, Bay of Naples and surrounding area. 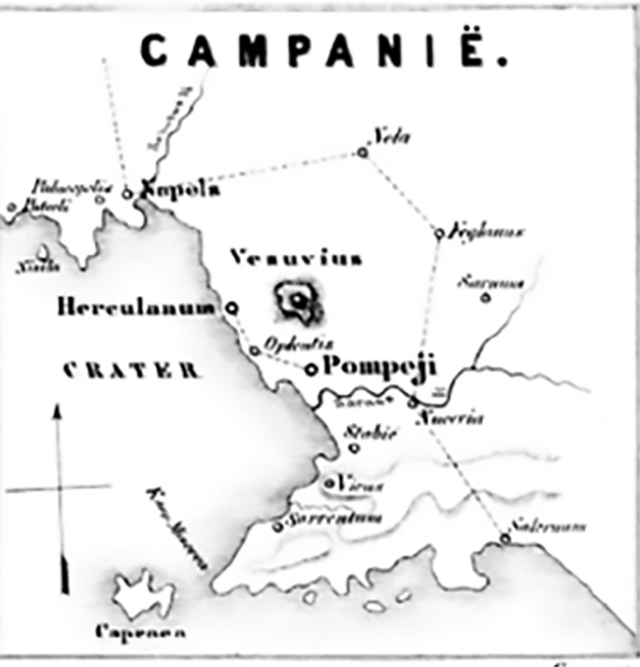 Map of Bay of Naples and Roman Campania showing Pompeii. After Shepherd Historical Atlas 1911 from Wikimedia. 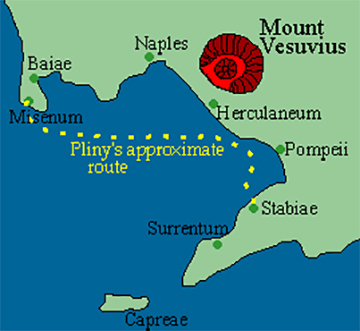 Sketch of Bay of Naples in 79AD showing the approximate route taken by Pliny the Elder from Misenum to Stabiae in his attempted rescue mission. Bay of Naples as it was before the 79AD eruption. 1939 reconstruction. Photo courtesy Deutsches Archäologisches Institut. DAI neg 39.105 1939. 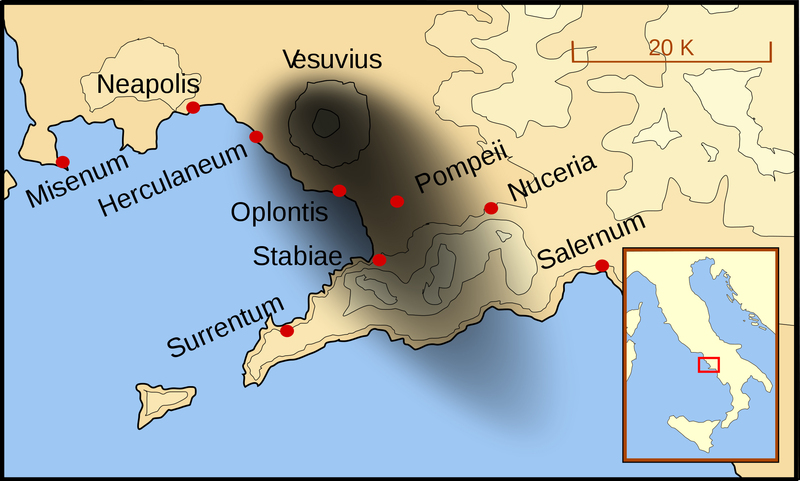 Plan of Vesuvius ash distibution from the 79 AD eruption showing the cities and towns which were affected. Photo by MapMaster, Wikimedia. 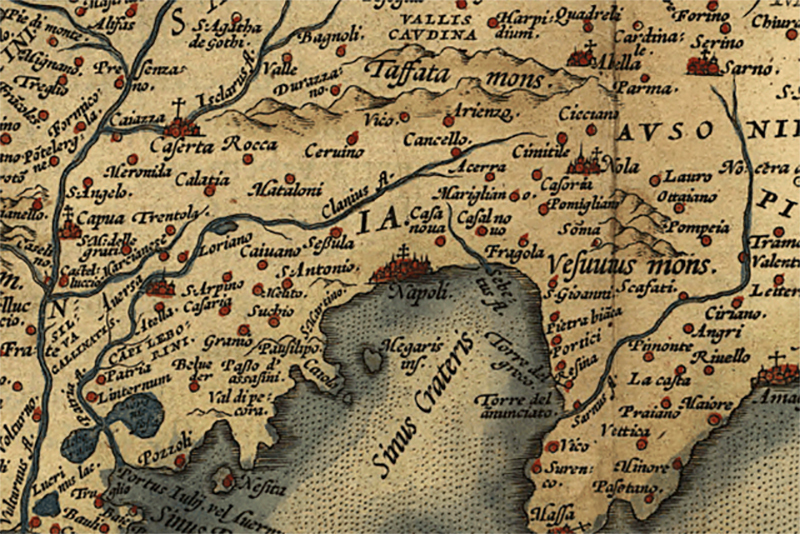 Map of Eastern Campania by Girolamo Mocetto published in 1514 in De Nola: Opusculum, Distinctum, Plenum, Clarum, Doctum, Pulcrum, Verum, Graue, Varium & Utile. 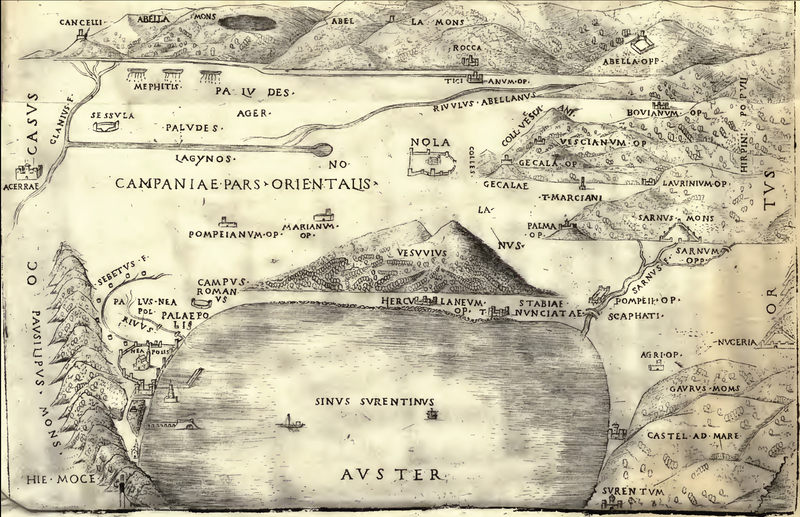 Map of Bay of Naples 1570 with a location for the as yet undiscovered Pompeii. Extract from Theatrum Orbis Terrarum, Abraham Ortel, 1570. A second version of the map. 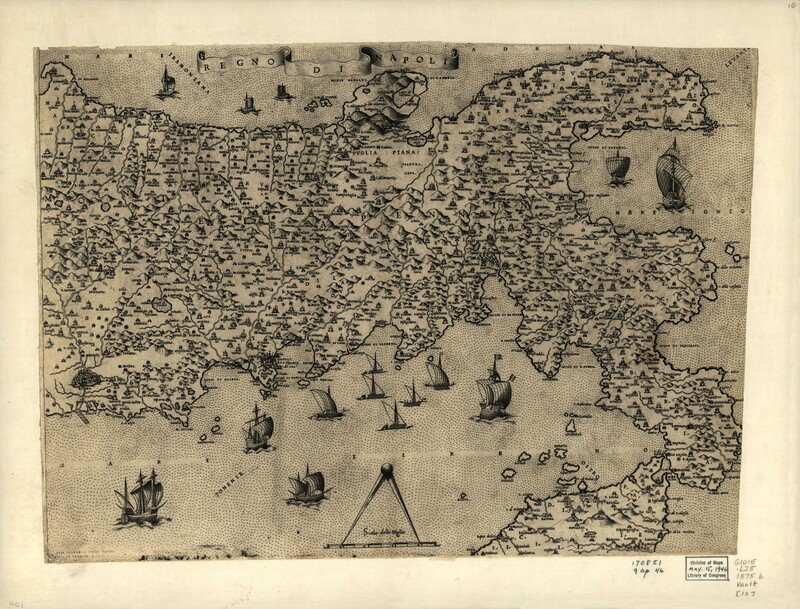 Courtesy of Library of Congress, Geography and Map Division. 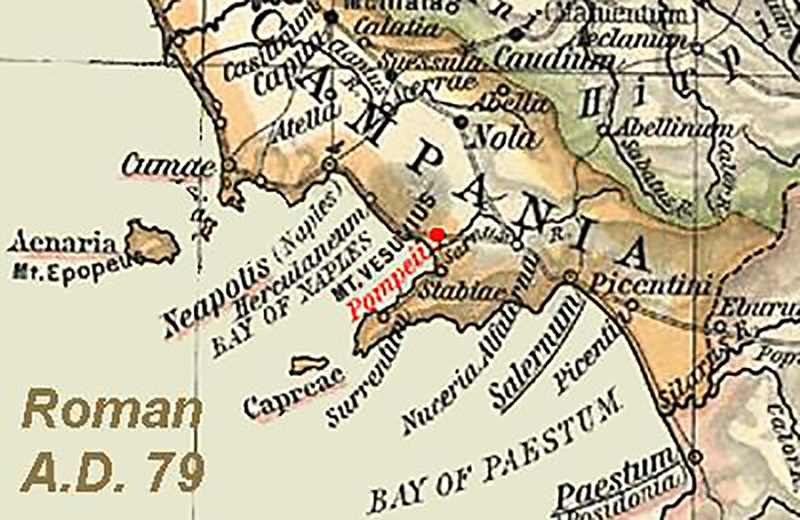 Bay of Naples 1603 with a location for the as yet undiscovered Pompeii. 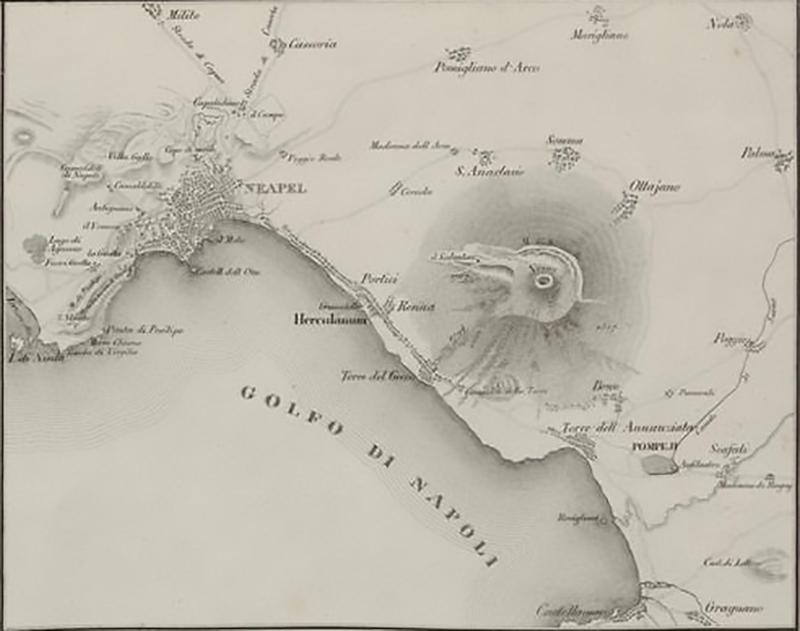 Map of Bay of Naples with Pompeii 1770. From a letter from William Hamilton, Naples, Oct. 16, 1770, Plate VI, Project Gutenberg, Wikimedia. 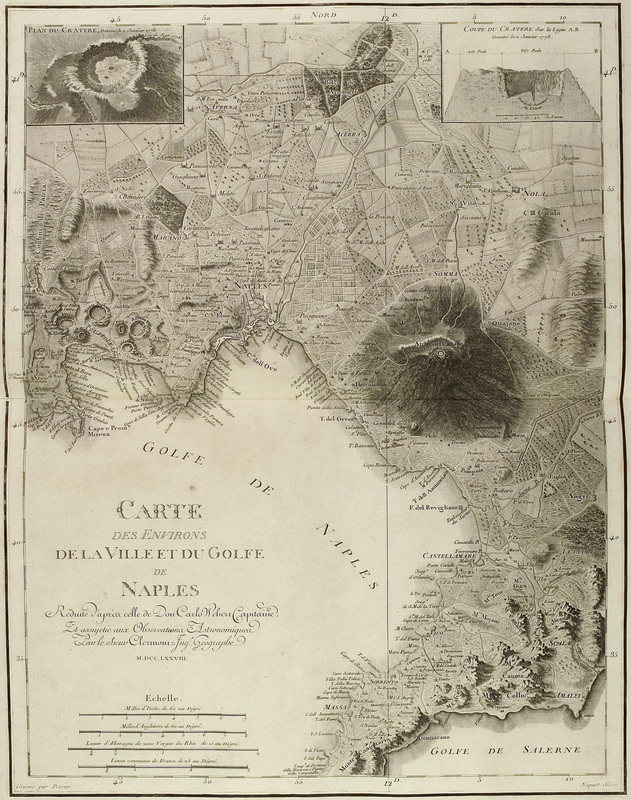 Carte des environs de la Ville et du Golfe de Naples, dated 1778. After Karl Weber. 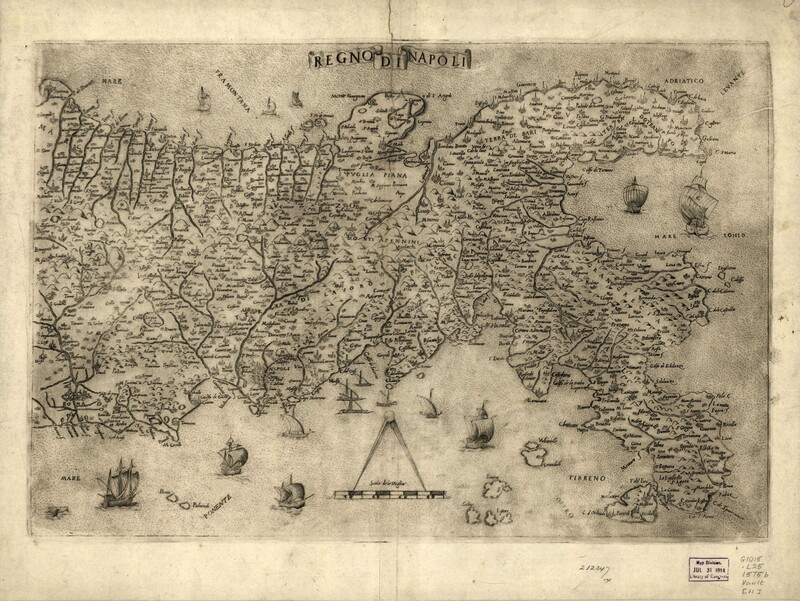 From Saint Non J., Voyage pittoresque ou description des Royaumes de Naples et de Sicile: Premier Volume, Premiere Partie, 1781. 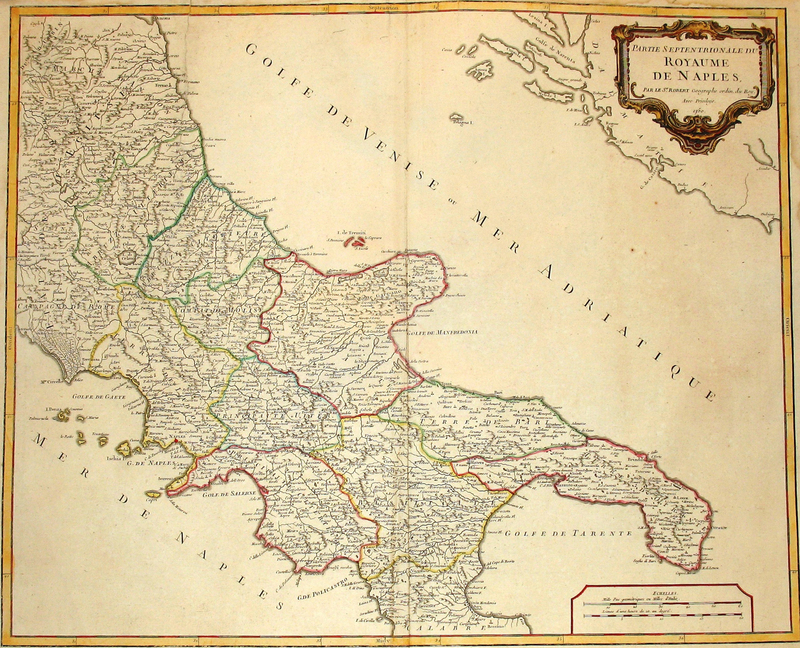 Map of the Royaume de Naples et de Sicile in 1780. From Saint Non J., Voyage pittoresque ou description des Royaumes de Naples et de Sicile: Premier Volume, Premiere Partie, 1781. 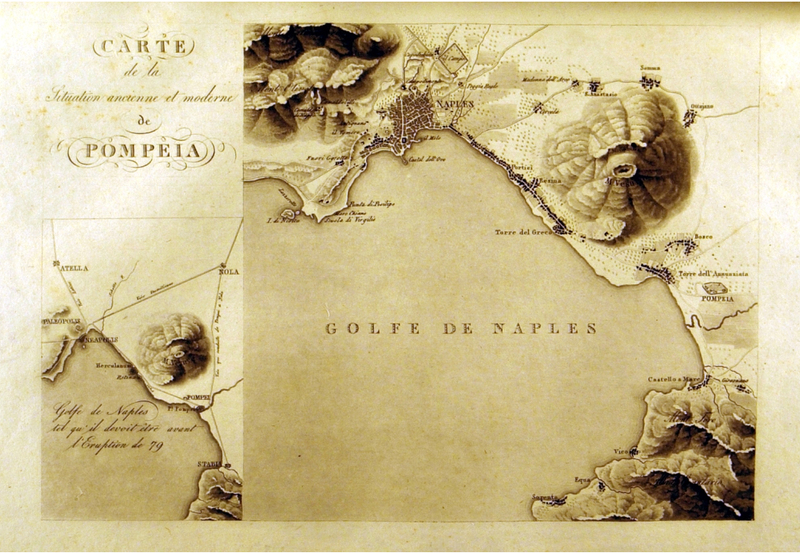 Map of the Royaume de Naples in 1780. 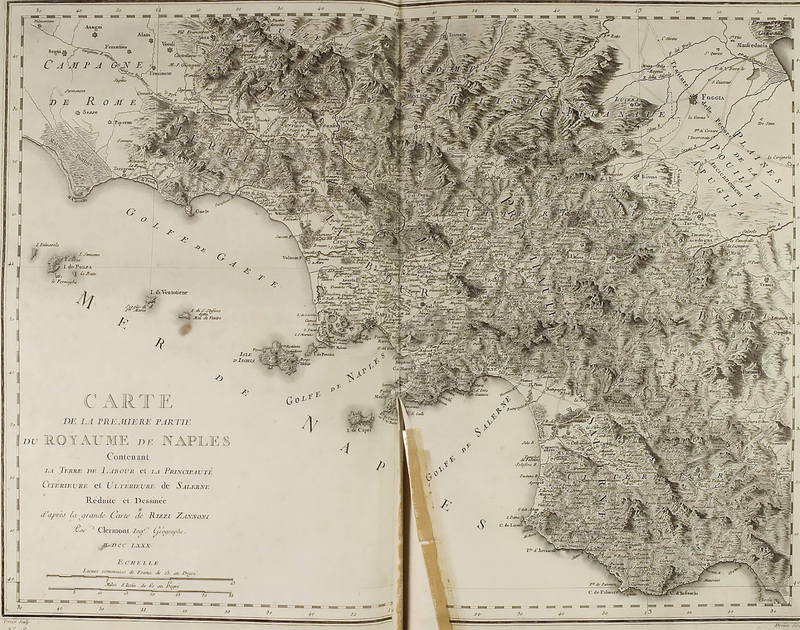 From Saint Non J., Voyage pittoresque ou description Des Royaumes de Naples et de Sicile: Tome primo, 1781. 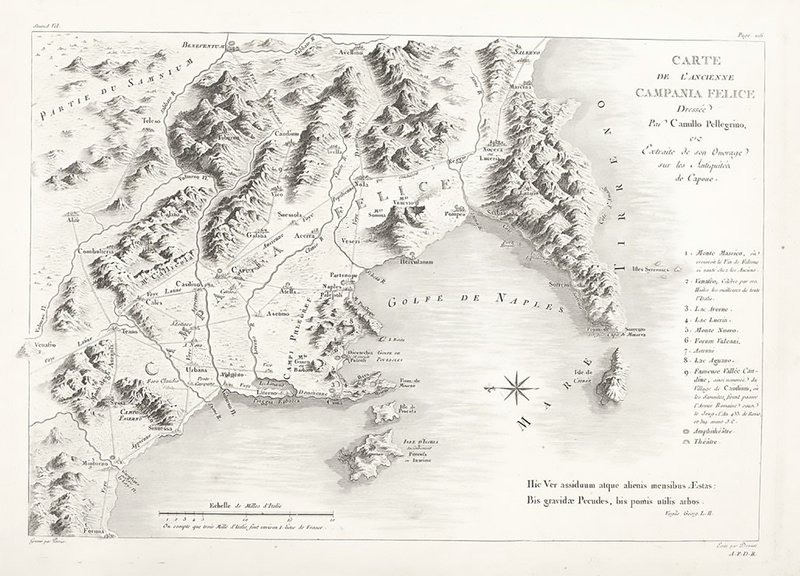 Map of Campania Felice from Saint Non J., Voyage pittoresque ou description Des Royaumes de Naples et de Sicile: Tome second, 1782, p. 226. 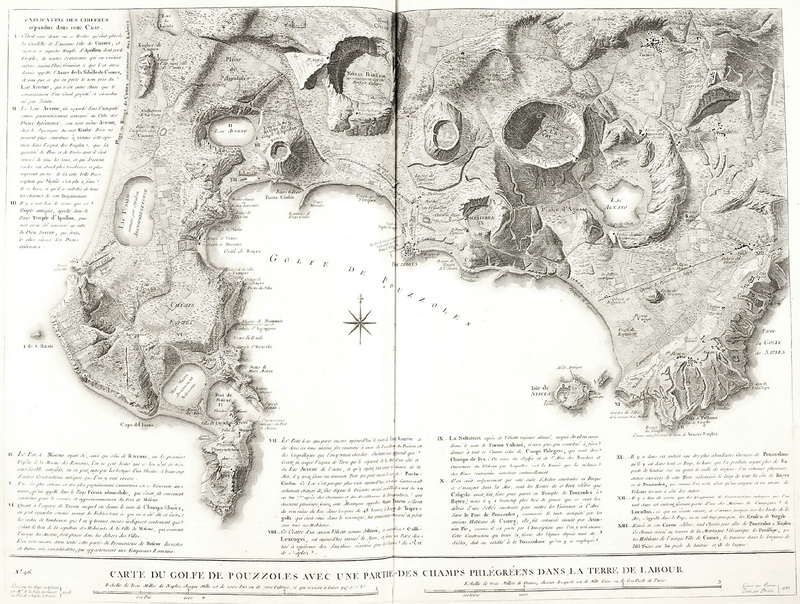 Map of Golfe des Pouzzoles from Saint Non J., Voyage pittoresque ou description Des Royaumes de Naples et de Sicile: Tome second, 1782, p. 159. 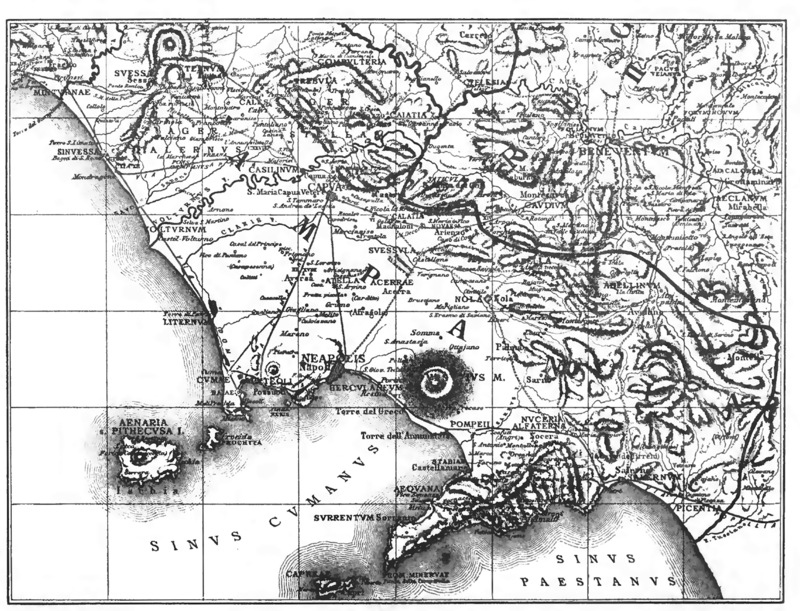 Map showing Vesuvius and neighbouring cities as they were in AD79. Published in Cooke, Cockburn, Donaldson, Pompeii, Part 1, 1827, plate 3. 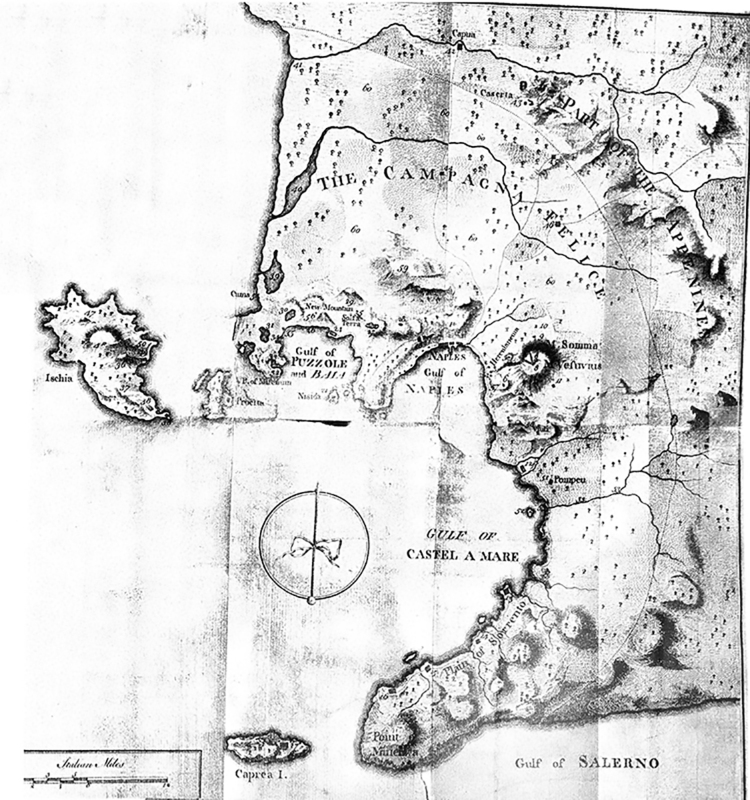 Map of Bay of Naples by Wilkins. 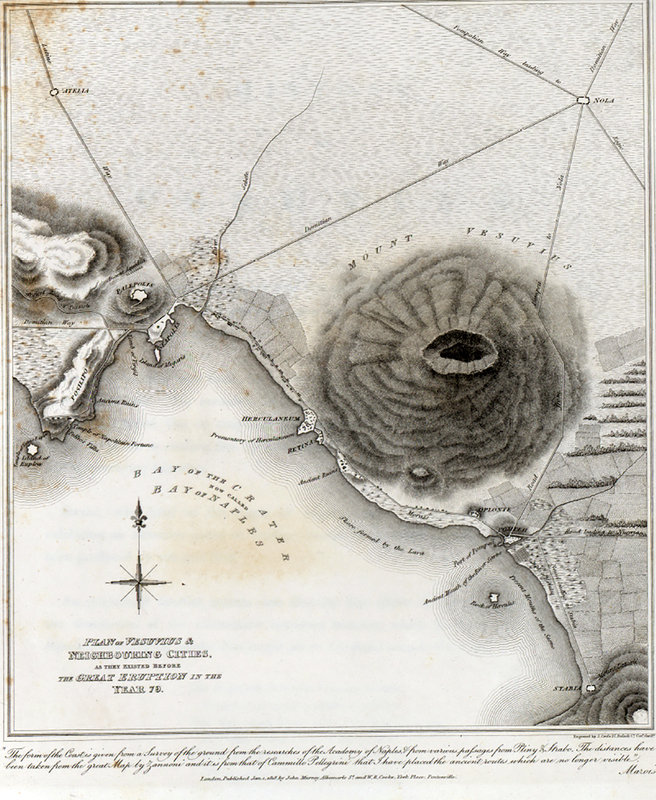 See Henry Wilkins, Suite des Vues Pittoresque des ruines de Pompei 1819. 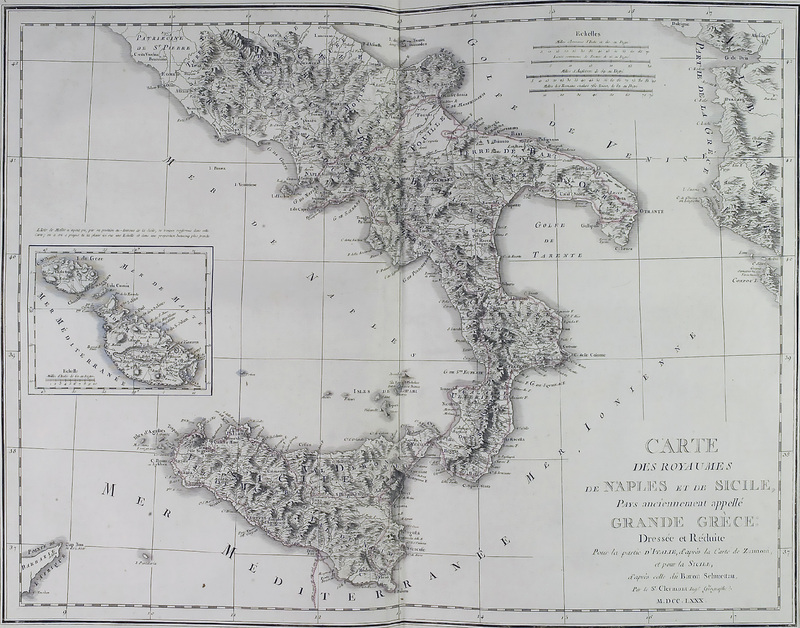 Plan of Campania published by Gell in 1819 and described as "Grounded on the modern survey of Zannini". 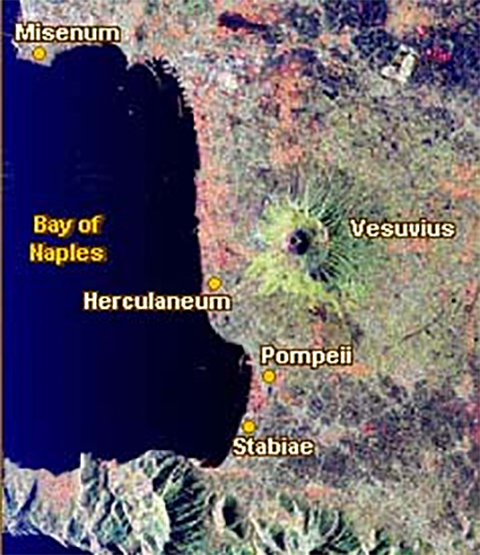 The Bay of Naples is described as "Bay of the Crater". 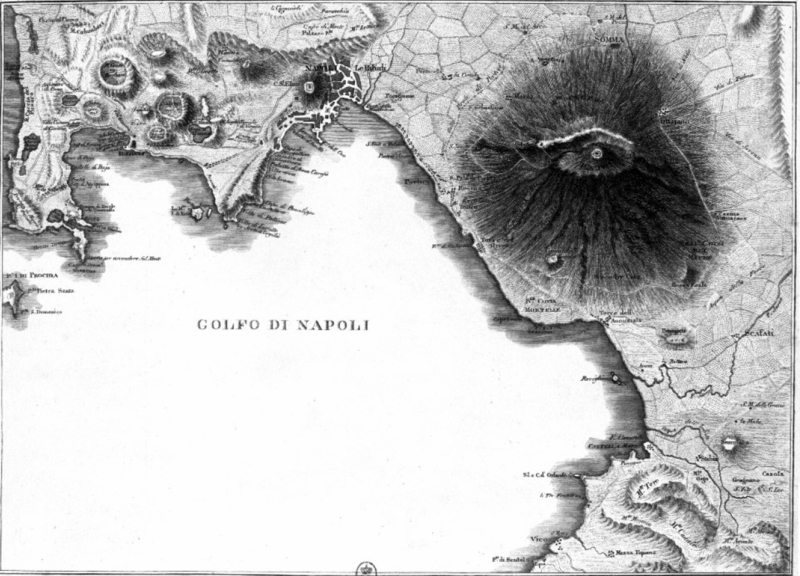 Map of Bay of Naples in 1827 with an inset map showing possible pre-79AD Bay of Naples. Published in 1876 by P. Fumagalli. Zahn W, Die schönsten Ornamente und merkwürdigsten Gemälde aus Pompeji, Herculanum und Stabiae, 1828, Band 1, plate 1. 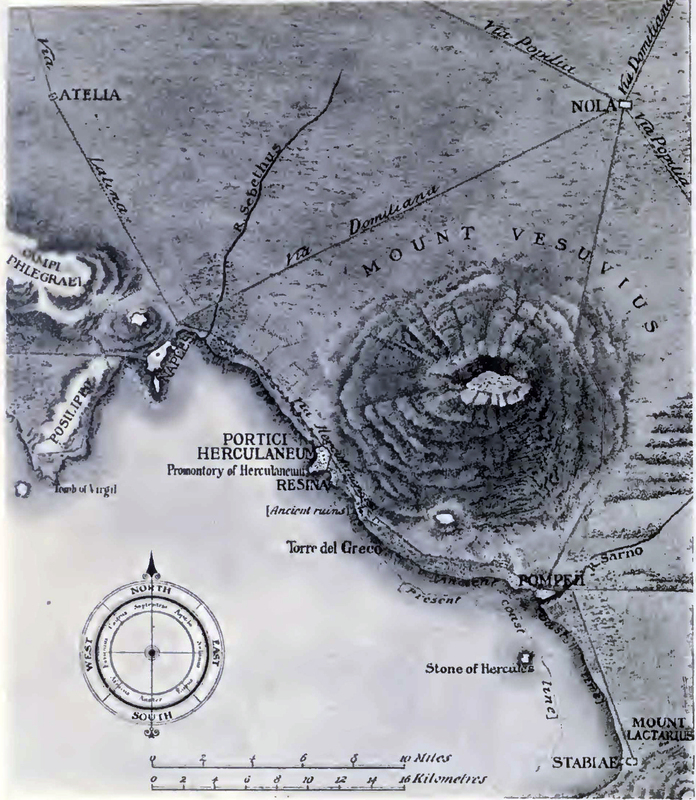 Plan of Bay of Naples 1864 by J. J. C. de Wijs published in Bouwkundige Bijdragen, Deel 17, 1870. Photo from Wikimedia. 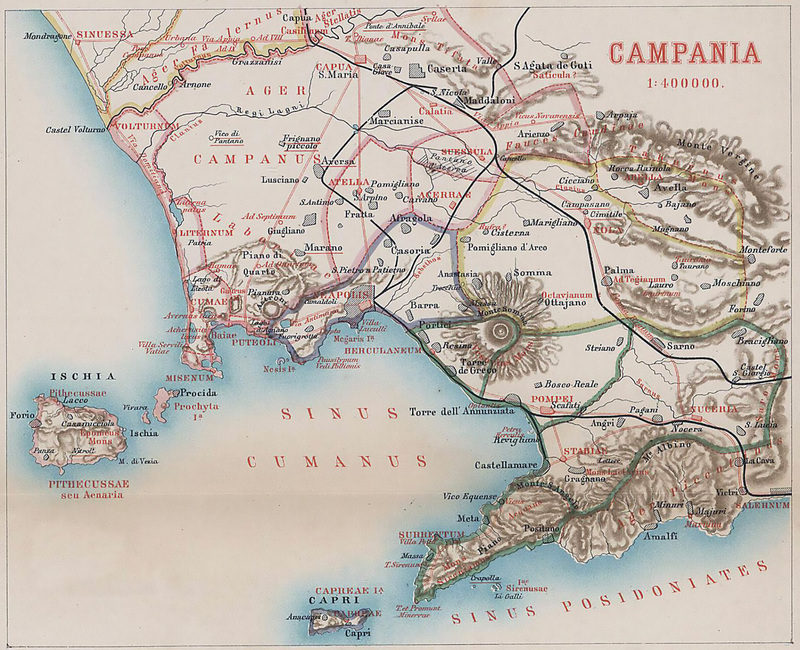 From Karl von Spruner’s 1865 rendering of Southern Italy and Sicily in antiquity, Wikimedia. 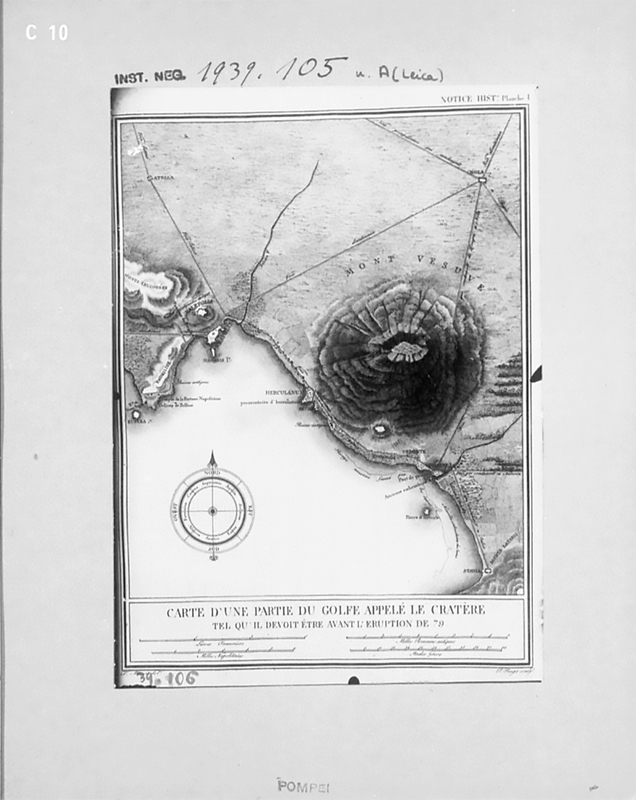 Plan of Bay of Naples in 1888. From Ruggiero M., 1888. 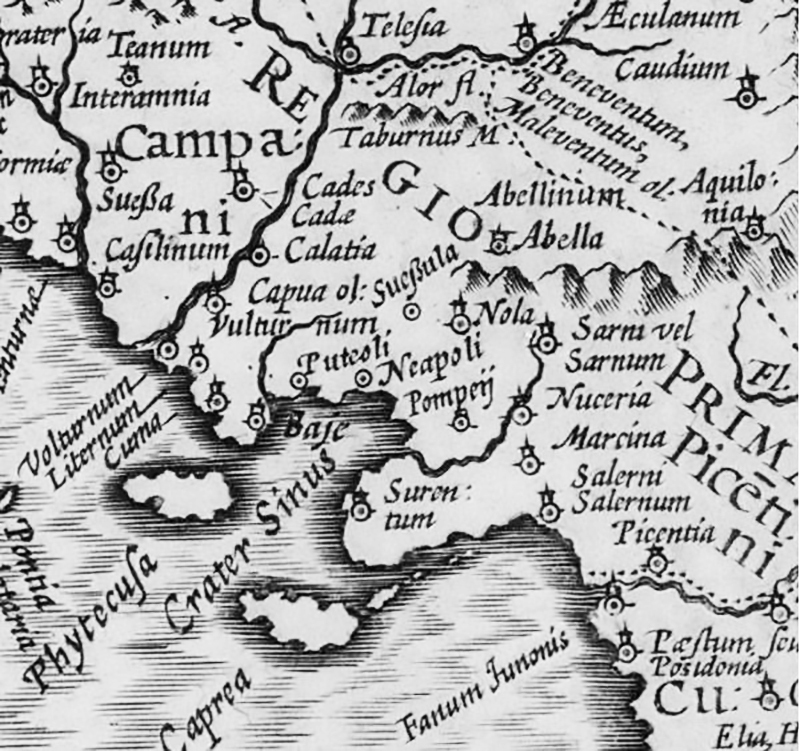 Degli Scavi di Antichità nelle Province di Terraferma Dell'Antico Regno di Napoli dal 1743 al 1876. Mau and Kelsey, 1899, Pompeii its Life and Art. 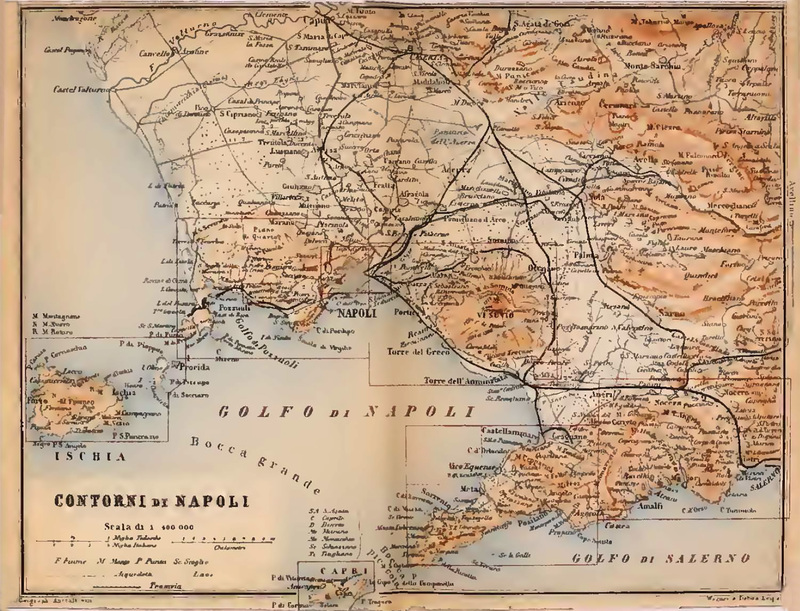 Map of Bay of Naples published by Baedeker in 1900. 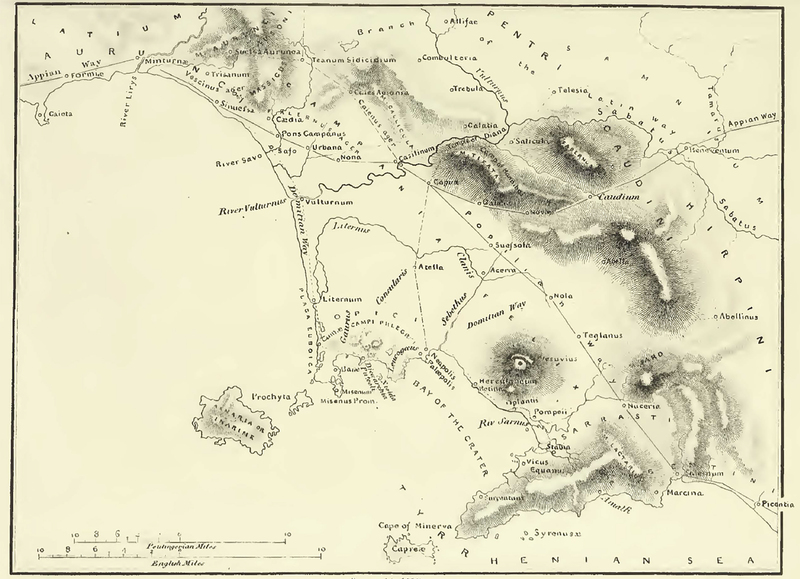 Map from Thomas Hughes, Herculaneum, 1906. 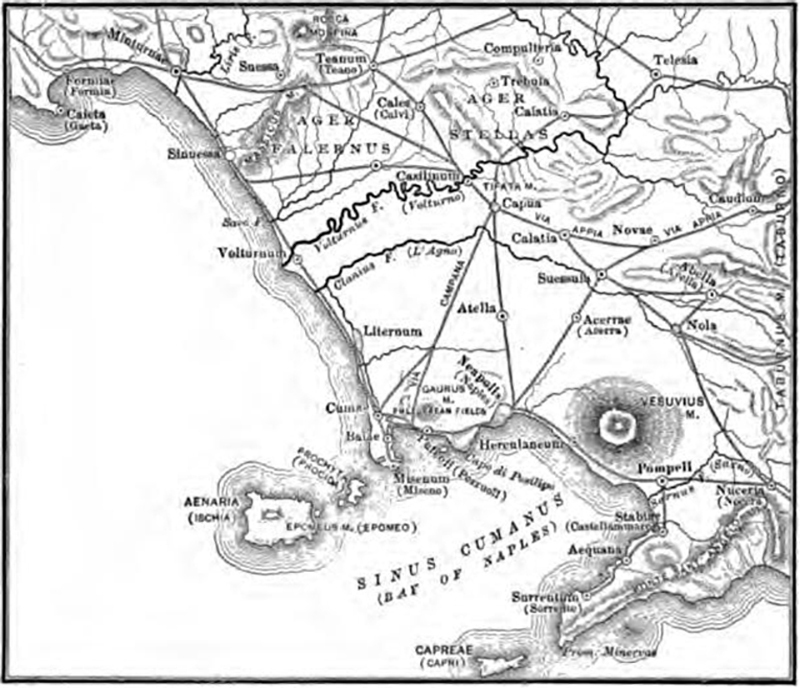 Map of the Campanian Coast "after Mazois" by Ethel Ross Barker in Buried Herculaneum 1908, plan 1. 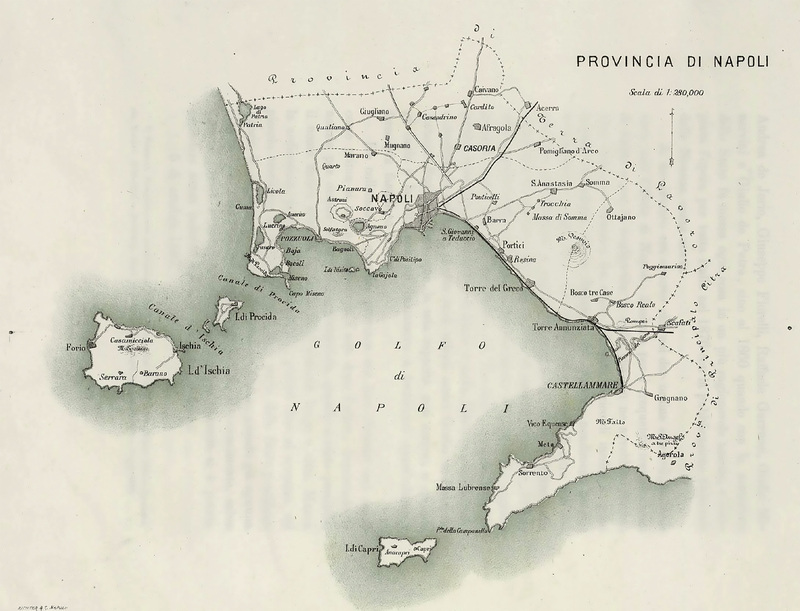 Plan of Campania by Peterson in 1919. See Peterson R. M., The Cults of Campania, American Academy in Rome, written and dated 1919, but due to the effects of the war it was not published until 1923. 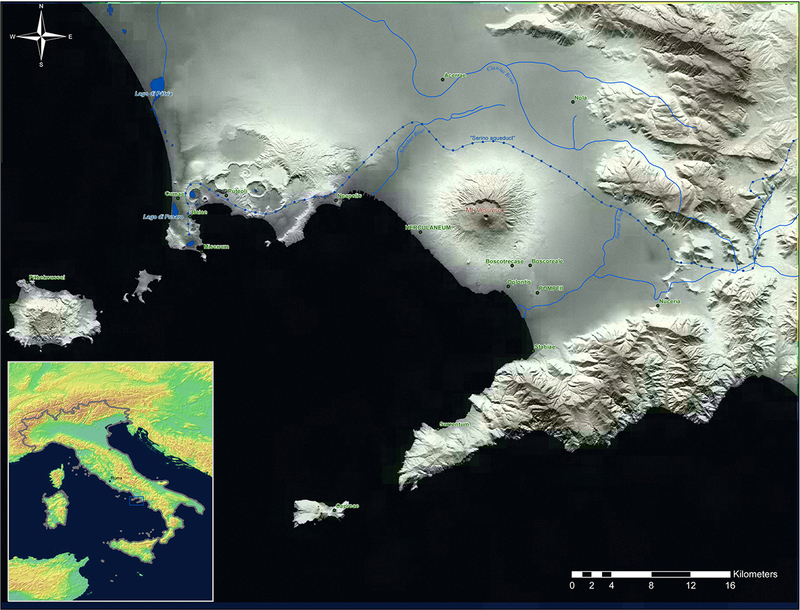 Dobbins J and Foss P, 2007, World of Pompeii, Map 1 from DVD. Pompeii, Herculaneum, Misenum, Stabia and Vesuvius from above. NASA.